Danes to be included in Genome Project. On the 25th January the Kennel Club Genetics Centre at the Animal Health Trust launched the "Give a Dog a Genome" project and we are pleased to announce that our application to be included has been accepted. The £1000 donation for each breed is being matched by the Kennel Club. All nine Breed Clubs are fully supporting this research to create the UK's largest Genome bank. This will be of considerable help in the understanding of the canine genome and improve canine health. The aim is to sequence the entire genomes (consisting of 2.4 billion DNA letters) of 50 different breeds by the end of 2016. The Health sub-committee made its initial enquiry to the AHT in mid-February, securing a place subject to receipt of the donation. The uptake in the project by breeds has been extremely quick. 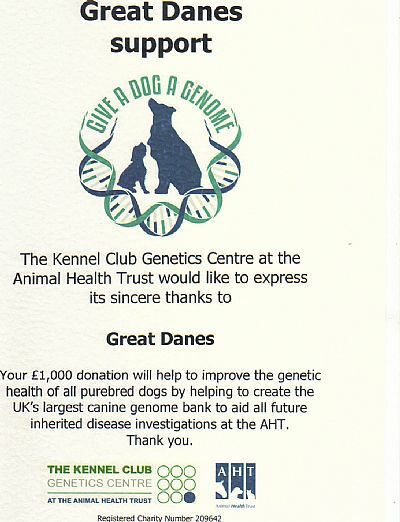 The £1000 donation money came from the Breed Council (8 clubs) and the Great Dane Breeders and Owners. There are now over 70 breeds who have applied to join and in addition to the original 50 required, the AHT hope to move forward in 2017 with a further 25. It is understood that we are included in the first 50 to be sequenced. As part of the enhancements to Breed Watch, from January 2014 the Kennel Club has collected health & welfare information from all Judges with appointments for Category 2 & 3 breeds as a mandatory requirement. Following appointments the breed Judge is required to complete the mandatory health monitoring form and return to the Kennel Club. Further information relating to the health monitoring process and health monitoring forms can be found here. 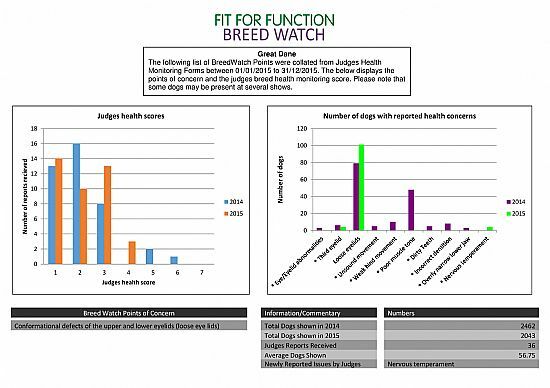 Attached is the annual Judge’s health monitoring summary for your breed for 2015, we have made some changes to give you a fuller picture of the reporting. The information shows what conditions Judges have reported as present in the breed in 2015 and the total number of dogs that displayed the condition(s). Also provided is the health score which Judges have given for the entire entry (please refer to the table below for the rating descriptions). The Kennel Club has provided the Breed Health Co-ordinator, the Breed Club(s) and if applicable the Breed Council with the information. If you have any questions in relation to the Judge’s health monitoring annual summary or any other aspects of Breed Watch please don’t hesitate to contact me on the details provided below.